Like many places, Québec has also created a policy framework to increase energy production from renewable sources such as wind. (1) Wind farm construction presents numerous challenges, but from a tourism viewpoint, it has a direct visual impact on scenic landscapes and an indirect effect on industry due to potential economic losses. 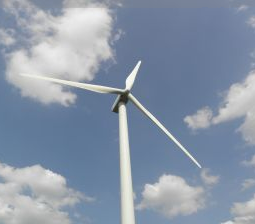 Opponents to wind farms believe that constructing large, towering metal structures creates an industrialized landscape in rural and natural areas, which some people consider to be detrimental. Wind turbines as tourist attractions? For some people, wind turbines are symbols of sustainable development and valued for producing clean energy. Perhaps this attitude can give wind turbines some recognition for being part of modern heritage. Windmills, the predecessors of modern wind turbines, were also contested when introduced to the European landscape around the 12th century. In countries like Holland, windmills today are a visual part of the nation’s heritage and in Québec, many are also tourist attractions, notably on Île Perrot and Île aux Coudres. However, wind turbines are unlikely to be a major tourism draw in their own right, especially since they are now increasingly part of the cultivated landscape in many countries. In some cases, they diversify the attraction base of a destination, like Cap Chat in the Gaspé Peninsula, where a visitor centre showcases the highest vertical-axis wind turbine in the world. Similar interpretation centres worldwide offer guided tours; in Denmark, for example, there are boat tours to see the offshore wind farms at Middelgrunden near Copenhagen. Preferences and attitudes towards modern wind farms are likely to evolve over time as people get accustomed to their presence, but it is unlikely that they will appeal to everyone in the future. While preference studies show broadly similar patterns, very few quantitative studies published to date have established empirical links between wind farms and the net economic impact on tourism. (8) Several studies use hypothetical scenarios to assess future preferences, thus indicating likely impacts on tourism. (9,10) Such studies tend to show that visitors would not change their travel patterns to an area if a wind farm were established, as 92% of visitors indicated in a survey in Southwest England, for example. (9) Overall, there is limited evidence to suggest that wind farms have a serious negative economic impact on tourism. In most places, like Québec, a variety of legislative and planning tools help minimize the social and environmental impact of wind farms. (11) In addition to its visual impact, wind farm development continues to push the limits of social acceptability in terms of its planning, management, operational control and fairness with regard to the distribution of benefits. (12) The few studies mentioned here suggest that even though the majority of tourists may appear positive about wind farms, one must look closer at preferences with regard to visiting places and choosing accommodations. In this context, it would be worthwhile to independently assess the effects of wind farms on tourism at the local and regional scale in Québec. (1) Ministère du Développement durable, Environnement et Parcs (2006). L’énergie pour construire le Québec de demain. La Stratégie énergétique du Québec 2006-2015. Québec: Gouvernement du Québec. 138 p.
(3) nouvelobs (2009). “Manifestation anti-éolien au Mont-Saint-Michel,” in Le Nouvel Observateur. September 26. Accessed online 10 Oct. 2009. (5) Synovate (2003). Perception et répresentation de l’énergie éolienne en France. Ademe. 18 p.
(6) Institute CSA (2003). Impact potentiel des éoliennes sur le tourisme en Languedoc-Roussillon, France. Synthèse de Sondage. 5 p.
(7) Richard Guay Consultants (2004). Étude de marketing auprès des touristes de la Gaspésie afin de connaître leurs attitudes face à l’installation d’éoliennes. A report presented to technocentre Éolien Gaspésie-les-Îles. Québec. 37 p.
(9) visitbritain (2006). Foresight. Issue 33. July. Strategy and Communications Division. (10) mori Scotland (2002). Tourist Attitudes towards wind farms. research study conducted for the Scottish Renewables Forum and the British Wind Energy Association. Final Report. Edinburgh. 24 p.
(11) Ministère des Affaires municipales et des Régions (2007). Guide d’intégration des éoliennes au territoire : vers de nouveaux paysages. Québec: Gouvernement du Québec. 38 p.
(12) Saucier, C., Côté, G., Fortin, M.-J., Jean, B., Lafontaine, D., Feurtey, É., Guillemette, M., Méthot, J.-F. And Wilson, J. (2009). Développement territorial et filière éolienne. Des installations éoliennes socialement acceptables : élaboration d’un modèle d’évaluation de projets dans une perspective de développement territorial durable. Rimouski: Université du Québec à Rimouski. 227 p.